The latest Civilization game surprised many people back in 2016. After all, Civilization VI was another great entry in the long-running strategy series of video games. And all those who love the game’s turn-based strategic gameplay and historical detail sure were thrilled with Sid Meier’s latest game. As has been the case with most Civilization games to date, game creators Firaxis have already released one expansion pack for Civilization VI. The Rise and Fall expansion pack made several interesting changes and additions to Civilization VI, but sadly didn’t do enough to consider it essential. However, the upcoming Gathering Storm expansion looks more promising, as it will add natural disasters such as volcanic eruptions and floods, adding an element of tension to the game. Also, Gathering Storm will bring several new civilizations (civs for short) to the game, letting you play as the likes of Canada and the Inca, amongst others. Developer Firaxis recently revealed another civ which will feature in the Gathering Storm. 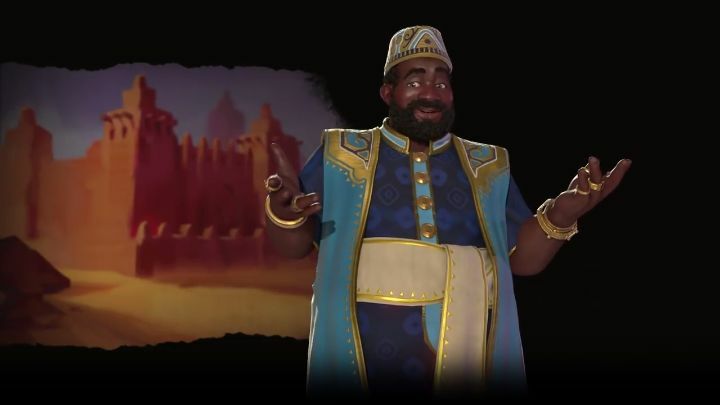 This is Mali, which in the game is led by Mansa Musa, a man whom according to Firaxis’ preview video below could have been the wealthiest person of all time. This is reflected in the game too, and for instance any mines that you build when playing as Mali in the game will generate extra gold (at the expense of production though). Also, Mali’s unique district, the Suguba, grants a discount when making purchases with gold (or faith), letting you stack up extra gold throughout the game. This district also generates additional gold when placed adjacent to rivers. All this might be enough to gain an edge over rival civs in the game, but Mali also has other ways to generate additional gold in the game via its unique unit, the Mandekalu Cavalry. This is because you gain gold from killing rival’s military units with this Medieval era unit, meaning it’s likely to become the backbone of your armies when playing as Mali in the game. The path to riches is also made easier by the fact that trade routes generate extra gold for each desert tile which forms part of the origin city during Golden Ages, meaning Mali is one of the few civs in the game which can truly buy its way to victory. It can also thrive on desert maps, not only though to the aforementioned perk, but also due to the fact that city center tiles get extra food (and faith) when surrounded by desert tiles. It’s clear then, that Mali will allow players to try new strategies in Civilization VI, a game which already is bursting with features, but which will hopefully end up being even more interesting when the Gathering Storm expansion launches next month.